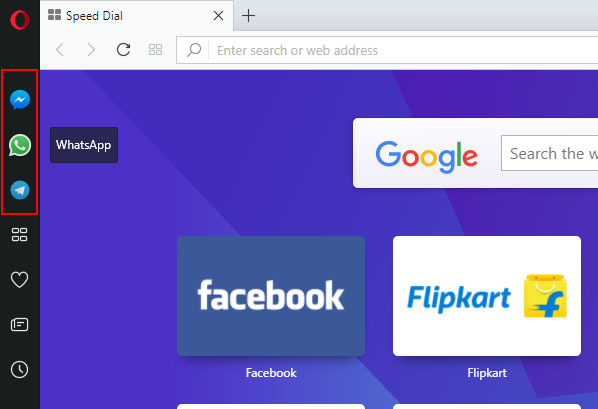 If you want to stay connected with your Facebook, WhatsApp and Telegram friends with browsing, then Opera Browser invite you to user their new features available on their new versions. Opera browser helps you to make your Facebook, WhatsApp and Telegram chats like a web based application that are attached with your browser. In their latest version, there are many new icons located at the left bar of the browser. Which allow you to access the web version of WhatsApp, Facebook and Telegram directly without installing any third party application or Add-on. By clicking on these icons, you will get a web messenger of these applications. Pinning on browser is a best option for people, who want keep touch with these chat applications always. This option makes the chat window attached to the browser like a new browser window. You can simply adjust windows size by dragging on the edge of the Window. It is better to choose a smaller window if you have pinned the window with browser. 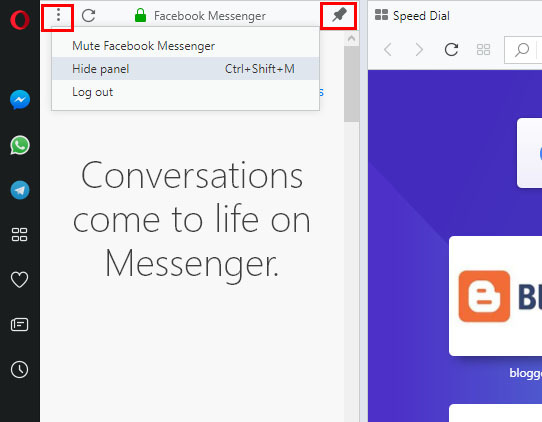 This option is located under ‘Options’ icon, which hide your messenger panel (window). Ctrl + Shift + M shortcut can also hide the panel. This option logout your account. If you don’t want such icons on your browser or if you can’t see Telegram icon, then right click on the left bar, there you can manage icons on this bar. Opera introduced all these option for user attraction to use their Opera browser. Personally I use opera as my major browser. Here you can differentiate browser based on their performance and speed.